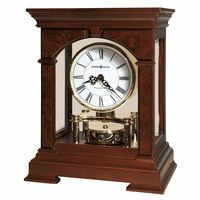 A solid arched bonnet on the crown and reeded pilasters with top and bottom turned capitals is shown on this clock finished in Country Maple on select hardwoods and veneers. 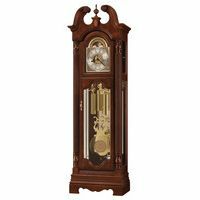 An interior light reflects off of the three adjustable glass shelves and is a perfect display for collectibles. Access to these shelves is made easy with a full length right side glass door. 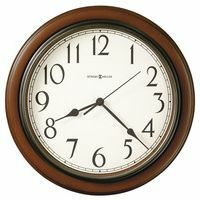 A time only quartz movement uses one "e;AA"e; battery (not included).